These look pretty good, eh? Well, let me tell you, looks can be deceiving. I made these pretty little things for New Year's Eve and they did not taste as lovely as they look. I found a Rachael Ray recipe for Lime Margarita (margs!) 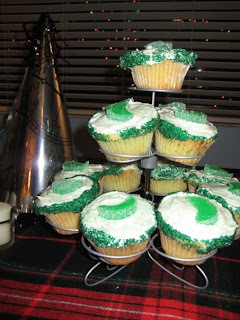 cupcakes and thought they would be the perfect NYE treat. I'm not sure where I made a wrong turn in the baking, it was from scratch, but they were pret-ty terrible. I didn't even eat one myself! I think it was more the icing than the cake but my mom and I put a lot of hard work and time into them for nothing. I even grated 4 limes for some zest! I had one of my friends try it and the face he made was perfect. I wish I had captured it on camera. Ha! It makes me laugh just thinking about it. So the moral of this story is that, firstly, not all Ray-Ray recipes are fabulous and secondly, a cupcake might not taste as good as it looks. Too bad.